Travelers will find many unusual hotels in Budapest. Hotels on water have become the calling card of the city. Boat Hotel Fortuna is one of these hotels. The boat hotel is docked not far from Margaret Bridge and will fit both leisure and business travelers. Inside, visitors will find 42 elegant rooms designed in accordance with traditions of the past. The rooms come with wooden furniture and bright textiles. There are special meeting rooms for business negotiations and other events, and, for relaxation, guests are welcome to attend the Lord Nelson restaurant specializing in Hungarian cuisine. 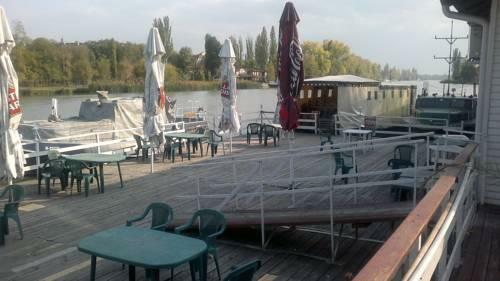 When it’s warm outside, some tables are put on deck, and in the evening visitors can try delicious barbeque. Another unique historic building, which was constructed in 1793, is currently used as the budget Santico Art Hotel and Hostel. This hotel is also distinguished by a ton of peculiarities. The hotel is designed in bright modern style and decorated with interesting historic items – antique furniture, old paintings, vinyl records and even collections of retro magazines. An interesting fact – guests can purchase all the items they like. The charming historic hotel comes with a cozy inner yard that is currently made in pink shades. The yard was decorated by talented graffiti artists. A private art studio is another interesting peculiarity of this hotel, so there’s no wonder why it’s so popular with creative and artistic people. If you enjoy resting in unusual places, Botel Hotel Lisa might be exactly what you need. 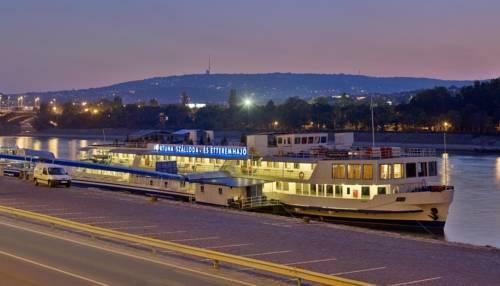 This ship hotel is docked on the Danube River and features numerous comfortable rooms and various interesting services. There is a wonderful restaurant at the hotel that specializes in the national cuisine. The wonderful hotel would be a great place for any kind of celebration. When the weather is fine, guests of the hotel are welcome to relax on the spacious deck of the ship. The comfortable and charming Minoo House is also worth mentioning. This guest house is located in a magnificent historic building just a few minutes’ walk from the National Museum. The building was fully reconstructed not long ago and the upgraded design was developed by a team of young professionals who managed to combine different styles. The design is based on light wooden elements, and all guestrooms and public spaces are also made in light shades. Unique art installations are the main distinguishing feature of the hotel. These installations were made of various antique decorations. Guests will also find a rich collection of vintage items, exclusive designer jewelry and modern paintings at the hotel. This guide to unusual hotels of Budapest is protected by the copyright law. You can re-publish this content with mandatory attribution: direct and active hyperlink to www.orangesmile.com.